So begins the narration of George Tertseti to describe the memoirs of the great protagonist of the Greek Revolution of 1821, Theodoros Kolokotronis. The family of Kolokotronis contributed significantly to the Greek war, and resulted to about 70 deaths of their family members. His father had joined the Kleftarmatolous and participated in the rebellion against the Orlov. Orphaned by his father in 1880 at the age of 15 years, and entered the Federation Zacharia’s together with other Heroes of the revolution where he starts the action of the liberation struggle. From the beginning he stood out for his military skills, and in a short period of time he became a henchman. 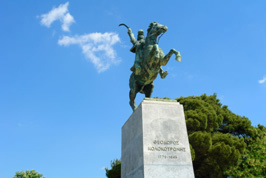 From 1810 to 1816, with the great persecution, he fled to Zakynthos where he served in the British Army where he gained military expertise, later he applied in the struggle for independence. In 1818, he joined the Filiki Etairia -Society of Friends. In 1821 he returned to Peloponnese starting the revolution from Kalamata, where he is occupied with Petrobey Mavromichali. Followed by other successes in the fight against the Turks like the the battle of Valtetsiou (12-13 March 1821), which literally annihilated the Turkish forces that paved the way for the fall of Tripoli on September 26 of the same year. 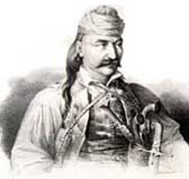 One of the major victories of Kolokotronis was the decimation of the Turkish army in Dramali at Dervenakia, in which he mobilized the villagers of the region to achieve his plan. From 1823 to 1826, civil war erupted between Greek chieftains and politicians. Kolokotronis had already begun to address the policy and tried to ease the tension between them. But the politicians didn’t like that and assassinated his son Panos and after that jailed him to the Prophet Elias in Hydra. Eventually they released him to confront Ibrahim and continue the revolution. Despite the friendly feelings of the Russians, he argued that we should not involve foreign forces in the Greek war because, they primarily want to serve their own interests and then care for the Greeks. After the election of Kapodistrias as a governor, Kolokotronis sided with him and played a decisive role in the election of Othon. The unkapodistrians were the cause of his imprisonment on September 7, 1833 which imprisoned him in Akronayplia with the accuse of treason along with Plapouta, son of Gennaios, the Tzavela the Nikitara and other military chiefs. On March 26, he was sentenced to death but it didn’t got signed by the court. He remained in prison until his old age when Othon released him on May 27 1837 by paying off many politicians and officers. Othon appointed him Counselor of State,instead of his general at arms position. Later he was awarded with the Grand Cross of Christ and stood loyal beside the King, without requiring consideration, since he was selfless. He died on February 4 1843, from a stroke immediately after the wedding of his little son Colin. The burial took place in the First Cemetery of Athens, and later in October 10, 1930 the bones were transferred to Tripoli at the monument notables. In September 25 1993,he was moved in a special case at the base statue.